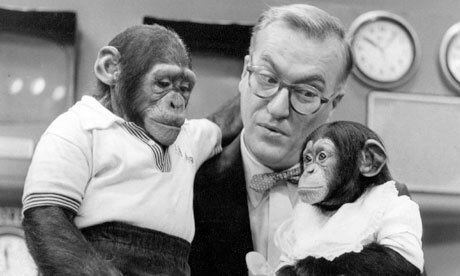 J. Fred Muggs (left) shown with Dave Garroway and his girlfriend Phoebe B. Beebe on the Today show in the 50’s on the NBC television network. It was a shock to me to find out today, that J. Fred Muggs is still alive and living in Florida at the age of 61. His girlfriend, Phoebe B. Beebe is also still alive and they are living happily together. The addition of J. Fred Muggs to the Today show may have saved the long running show from cancellation as he attracted advertisers to the show. 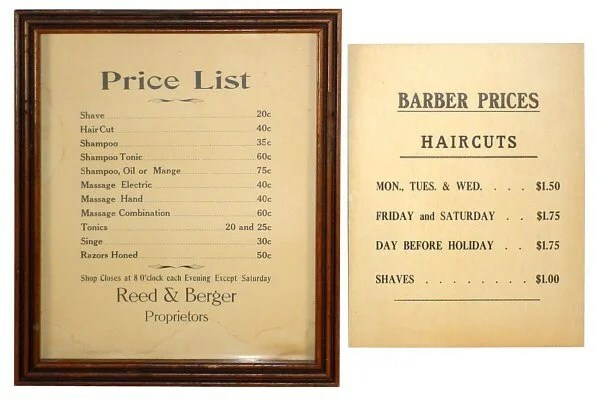 In the 1950s, the Russian newspaper, Izvestia, described J. Fred Muggs, as “a symbol of the American way of life”, and said, “Muggs is necessary in order that the average American should not look into reports on rising taxes, and decreasing pay, but rather laugh at the funny mug of a chimpanzee. Life began for J. Fred Muggs on March 14, 1952 in French Cameroon and is now 61 years old. Age is unknown of his domestic partner Phoebe B. Beebe. Dave Garroway the host of the Today show grew jealous of Muggs and reportedly spiked his orange juice with benzedrine to make him misbehave. J. Fred Muggs was the subject of a Little Golden Book. The book is currently being sold on eBay for $24.99. 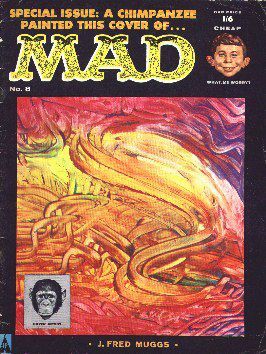 J. Fred Muggs fingerpainted this cover of Mad Magazine. There are currently 74 items about J. Fred Muggs for sale on eBay, including a photo of him with President Harry Truman, apparently after Truman left office and was visiting the Today show. J. Fred Muggs shown catching up on the latest news. This is a photo of J. Fred Muggs asking President Eisenhower for an increase in the minimum wage for monkeys. J. Fred Muggs debating whether to dive from highest diving board or to play it safe. This is a photo of J. Fred Muggs making his valedictorian speech for the 1977 class of Monkey Business University, which educates monkeys for a career in the corporate world. Royal Crown Cola and Double Decker Moon Pie. 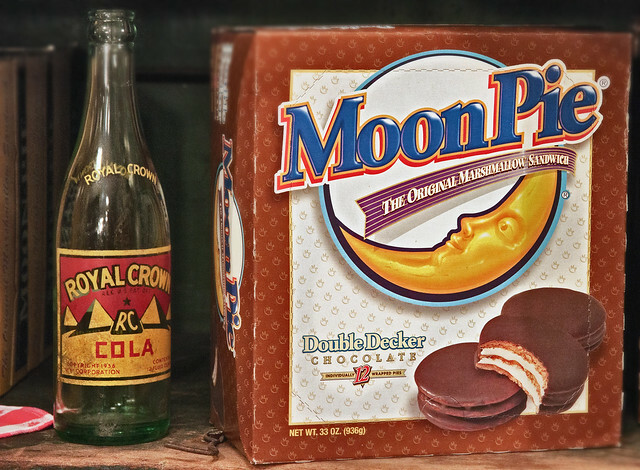 RC Cola and Moon Pies have been staples in the south for many years. Even better is a RC Cola with a Double Decker Moon Pie that is in the above photo. The combination of RC Cola and Moon Pies became popular in the 1950’s, when workers enjoyed them with their lunch. The RC Cola ginger ale was founded in 1905 by pharmacist Claude Hatcher in Columbus, Georgia. Royal Crown was the first company to sell cola in a can in 1954 and would also be the first company to sell cola in an aluminum can. The cherry flavored RC Cola was one of my favorite cherry cola drinks, which came closer to duplicating the flavor of a soda fountain cherry coke than most cherry flavored drinks. Union Bottling Works was the first name of the company and it was later changed to Chero-Cola, then the name of the company was changed to Nehi in 1928. There were few sodas, that were as refreshing as a cold Nehi orange soda, on a hot summer day in Louisiana in the 50’s and 60’s. Mr. Hatcher dies on December 31, 1933 and the RC Cola soda we know today was developed in 1934. The Nehi company would change its name to Royal Crown Cola in 1959, due to the immense popularity of RC Cola. 1962 would bring Diet-Rite Cola, which was the first diet cola made by any company. Royal Crown Cola would go into the fast food business in 1978, by acquiring the Arby’s fast food chain. RC Cola has been purchased by Triarc Companies, Inc. in 1993, Cadbury Schweppes in 2000, and Cott Corporation in 2001. Chattanooga Bakery was founded in 1902 in Chattanooga,Tennessee. There is an interesting story behind how the moon pies became their best known product. Coal miners were wanting something solid and filling, since they didn’t always have time for a real lunch break. Mr. Earl Mitchell Sr. returned to the store after talking to the miners and noticed employees dipping graham crackers into marshmallow and leaving them in window to dry. They then came up with the idea of adding another cookie on top of the graham crackers and adding chocolate covering to the cookies. The first moon pie was sold in 1917 and went on to become one of the most popular products for the Chattanooga Baking Company. Hundreds of thousands of moon pies were sent to soldiers serving overseas during World War II. 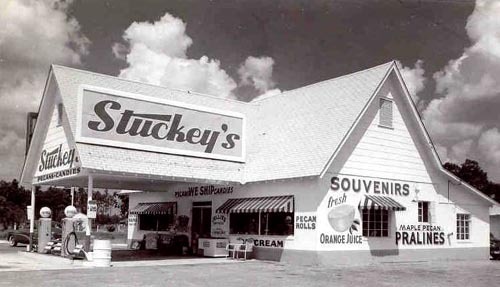 Racegoers to NASCAR races in the 50’s were known to carry moon pies with them to the races. The first Double Decker Moon Pie was manufactured in 1964 and it is my personal favorite, since it has three cookies and two layers of marshmallow in each Double Decker Moon Pie. Moon pies started being thrown in Mardi Gras parades in the 1970’s, since they were softer, than the Cracker Jack boxes that had been thrown in previous parades. Mini moon pies which debuted in 1998. The larger moon pies were ruining the appetites of kids, before dinner so a mini moon pie was developed to give the kids the taste of a moon pie, without filling them up so much, that they wouldn’t eat their dinner. Sam Walton the former owner of Wal-Mart was telling about how he motivated his employees, by having them tell about their favorite product. Walton then proceeded to talk about his favorite product and brought out a box of moon pies and extolling the virtues of the moon pies. The world’s largest moon pie weighs 50 pounds and consists of 14 pounds of marshmallow, 6 pounds of chocolate and contains 45,000 calories and is 40 inches wide. A person would be well advised to not try to eat it in one sitting. Celebrity Apprentice All Stars minus Omarosa and La Toya Jackson shown with Donald Trump. Celebrity Apprentice All-Stars should provide plenty of drama this season. Donald Trump has assembled a cast guaranteed to spark some fireworks. With Dennis Rodman, Omarosa and Gary Busey in the cast we can expect a lot of in-fighting among the contestants. Trace Adkins and Bret Michaels were chosen by Trump to pick their teams. Michaels made a huge mistake, by selecting Omarosa first for his team. Trace Adkins’s team chose Plan B, as the name for their team and he was chosen as project manager. Michaels was prepared to be project manager for his team after naming the team Power, but reluctantly let Brande Roderick be the project manager, when she got down on her knees begging Michaels for the job. The challenge was for each team to make meatballs and sell them to those on street and to celebrities. 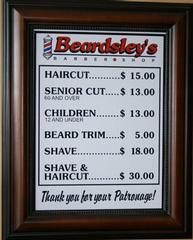 However, Trace Adkins decided to close his meatball store and sell only to high rollers. Adkins became very upset when Gary Busey went outside and hollered at the people on a tour bus to come in and buy some meatballs. So Adkins team really had little to do, since they more or less waited for the big money to come in. Amy Grant came in and donated $75,000, but the big contributor was T. Boone Pickens who sent his representative with a check for $100,000. Meanwhile Stephen Baldwin apparently didn’t call anyone as he collected no money. His reasoning was why use up his contributors to help Trace Adkins, when he could use those contributors on a week, when he was project manager. Power’s meatball store was a beehive of activity, as they scrambled to sell the meatballs to people off the street and to big contributors. Roderick made a huge mistake, by putting Omarosa in charge of keeping track of which contestants had raised how much money. Omarosa was talking about bringing down Bret Michaels. Trump called all the contestants into the boardroom and found out, from Steven Baldwin that Baldwin had not collected a penny. Trump said that Baldwin was at a risk of being fired if Team Plan B raised the least money. He then asked Adkins if Baldwin should be fired and Adkins replied in the affirmative. Piers Morgan who along with Ivanka Trump were the advisors in the boardroom seemed to enjoy trashing Omarosa, who deserved the criticism since she was anything but a team player, by working against her own team member Michaels. It was then revealed that Team Power had raised $250,333, which included a $20,000 bonus for their meatballs being chosen the best on Live with Kelly and Michael. Then the total for Team Plan B was announced and they raised $419,539. When combined with the money Team Power raised it totaled over $670,000 raised for the American Red Cross, which was Adkin’s charity. Team B was sent upstairs to watch Team Power while they battled each other in the boardroom. Trump and the two advisors wanted to know who raised how much money but Roderick or Omarosa couldn’t give them a total, in which the numbers didn’t add up. I feel Omarosa was low-balling Michael’s total by mentioning he gave $15,000, while Michaels said he collected over $25,000. Roderick had raised $132,000, while rapper Lil’ John raised $60,000 according to his total, but $55,000 according to Omarosa. Roderick finally decided to bring Bret Michaels and La Toya Jackson in with her to the boardroom, while the rest of Team Power went upstairs. I have no idea why La Toya Jackson was brought back into the boardroom, since Omarosa didn’t have a clue as to how much each team member had given and her total didn’t match with the total raised by Team Power. Once Roderick, Michaels and Jackson returned to the boardroom it looked like Michaels would be going home. Trump who repeatedly said that Michaels should not have returned to the show. If he was that concerned about Michaels he could have refused to let Michaels return. Trump then asked Michaels how he (Trump) could fire Roderick when she raised $132,000, which was over $100, more than what Michaels had raised, then told Michaels he was fired. The show may be an hour too long, as the boardroom sessions seem to last longer and longer. Don’t know if I will be in the mood to watch this two-hour program week after week. Fans that love confrontation should see plenty of it as the season progresses. Omarosa by herself provides enough drama to keep the shows interesting and can see her and La Toya Jackson won’t be best friends on the show. There should be more confrontations between her and Piers Morgan, as long as he remains an advisor. I have a feeling Trump will avoid firing Omarosa as long as he can avoid it. He knows her value as a troublemaker on the show, to push buttons of the other contestants. One question I have about the show is how many times will the celebrities ask their big money contributors to contribute. I can’t imagine T. Boone Pickens donating another $100,000 if Adkins needs to raise money again this season. One down and 13 contestants to go. Note: This is the 900th article posted on Nostalgia and Now since it was first published in April of 2009.